"The Perfect and Upright Man"
Jonathan Edwards Jr. was born in 1745, the second son and ninth child in a throng of eleven. He was named for his father Jonathan Edwards Sr., early America’s most famous theologian and Princeton's third president (if only for two months). From an early age the family seemed to expect the younger Edwards to follow in his father’s footsteps—and, in many ways, he did. Like Edwards Sr., he would become a Congregationalist minister, serve as a college president, and die shortly after taking office. As with his father, contemporaries considered Edwards Jr. an intellectual giant—“one of the greatest minds of the age.” He graduated from Princeton in 1765, ranked first in a class of thirty-one. Benjamin Rush (‘1760), himself an Enlightenment luminary, recalled Edwards Jr. as “a prodigy of abilities and learning.” In a 1785 letter, Rush relayed a story from his brother, who graduated the same year as Edwards Jr.: that the teenaged student Edwards used to tutor Princeton president Samuel Finley in mathematics. 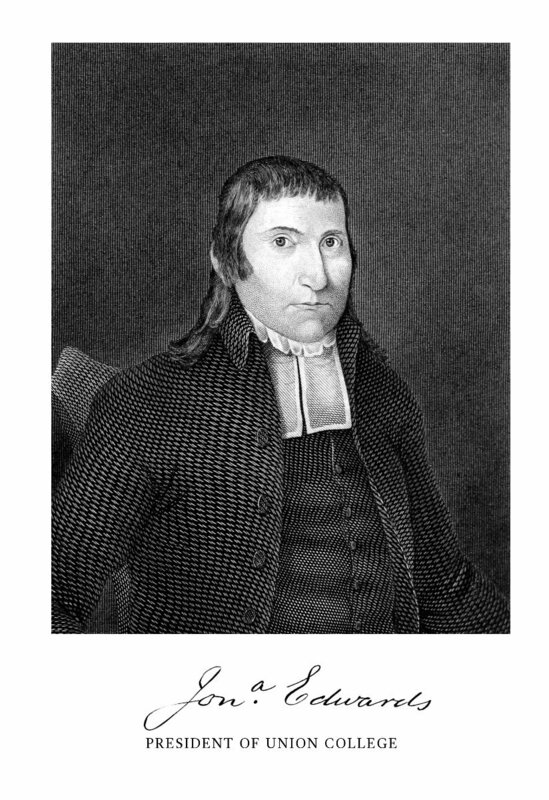 Engraving of Jonathan Edwards Jr. ('1766), Congregationalist minister and antislavery advocate. Yet beneath his outward austerity, Jonathan Edwards Jr. possessed a deep, abiding, and all-too-rare compassion for the most marginalized people in 18th-century society: Native Americans and enslaved Africans and African Americans. In Edwards’s world, slavery was legal in every British North American colony. Jonathan Edwards Sr. owned at least four slaves during his son’s childhood. Inspired by his faith and Revolutionary principles, however, Edwards Jr. was a leader in the first wave of American abolitionism—and one of the few abolitionists Princeton (with its long history of conservatism on the issue of slavery) ever produced. The elder Jonathan Edwards died 1758, when his son and namesake was only thirteen. But his example and legacy strongly influenced Edwards Jr.—spurring him to differentiate himself from the aspects of his father’s beliefs and actions that he considered hypocritical. Perfect or not, Jonathan Edwards Jr. was an early American minister who truly practiced what he preached. In 1751, at the age of six, Edwards Jr. moved with his family to Stockbridge, Massachusetts, a “praying town” founded by Protestant missionaries to convert the local Mahican Indians to Christianity. “At the time,” Edwards Jr. would write later in life, Stockbridge was “inhabited by Indians almost solely; as there were in the town but twelve families of whites or Anglo-Americans and perhaps one hundred and fifty families of Indians.” Edwards Sr. was the latest missionary sent to minister to the community, though he had little interest in speaking directly to his congregation. Believing that the “barbarous languages” of Native Americans were unfit for discussions of God and morality, the eminent divine preached through an interpreter. 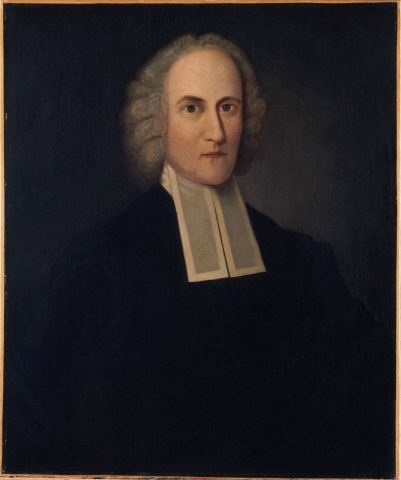 Portrait of Jonathan Edwards Jr., Princeton's third president and father of early abolitionist Jonathan Edwards Jr. ('1765). It became more familiar to me than my mother tongue. I knew the names of some things in Indian, which I did not know in English; even all my thoughts ran in Indian. In time, Edwards Sr. came to see the boy’s facility with languages as an asset. Envisioning a missionary career for his son, he sent Edwards Jr. two hundred miles southwest to Onaquaga, an Iroquois village on the Susquehanna River. One hundred miles from the nearest English settlement, 10-year-old Edwards Jr. lived among the Oneida tribe with Gideon Hawley, a preacher and former student of his father. The elder Edwards had “a design that I should learn their language, and thus become qualified to become a missionary among them,” Edwards Jr. wrote—but politics interfered. Edwards Jr.’s early experiences among the Mahican and Iroquois shaped the way he saw Native Americans as an adult, and their languages interested him throughout his life. In 1788, the younger Edwards published Observations on the Language of the Muhhekaneew Indians, an influential linguistic study of Mahican that mapped its connections to other Algonquian languages as well as its differences from Iroquoian languages. (Edwards Jr.’s treatise was widely read by political and intellectual leaders of the day: George Washington thanked him for sending a copy in 1788, and James Madison sent one to Thomas Jefferson in 1789.) And rather than rely solely on his memory, Edwards Jr. demonstrated his respect for Mahican leaders’ expertise when he consulted with a man he called “Captain Yohum,” a “principal Indian of the tribe” at Stockbridge, for revisions and corrections before going to print. It has been said, that savages have no parts of speech beside the substantive and the verb. This is not true concerning the Mohegans, nor concerning any other tribe of Indians, of whose language I have knowledge. It has been said, also, that savages never abstract, and have no abstract terms, which, with regard to the Mohegans, is another mistake. He listed the abstract concepts Native American languages could express—love, hatred, malice, and religion among them—the same as any European tongue. And in a final rebuke to his father, who had considered the language too “barbarous” for talk of God, Edwards Jr. translated the Lord’s Prayer into Mahican. In the 1770s and ‘80s, Edwards Jr. also took up his pen against slavery—another departure from his father. Though Jonathan Edwards Sr. spoke against the cruelty of the Atlantic slave trade and considered enslaved people his spiritual equals (God “condescends to poor negroes” as well as white Christians, he'd preached), the Congregationalist minister owned at least four slaves during his life, including two he likely brought to serve him at the President’s House in Princeton. For, however good a man he was, he had not arrived at sinless perfection. Finally, Edwards Jr. once again raised the specter of the patriarchs, biblical as well as contemporary. “Perhaps though this truth”—of the immorality of slavery—“be clearly demonstrable from both reason and revelation, you scarcely dare receive it, because it seems to bear hardly on the characters of our pious fathers, who held slaves,” he said. The son of a slave-owner himself, Edwards knew firsthand how difficult it might be for his congregants to criticize “our fathers and men now alive” for a practice that had long gone virtually unquestioned. “They did so ignorantly and in unbelief of the truth,” he conceded—or in other words, they were men of their times. Now, however, their time had passed. The late-18th century was a turning point in American political thought on slavery: an intermediate period between the colonial era, in which slaveholding had gone almost entirely unchallenged by Anglo-Americans, and the radical antislavery activism to come in the 1830s. Part of this shift was driven by gradual emancipation laws inspired by patriotic rhetoric of liberty and equality that many northern state legislatures passed in the wake of the American Revolution. I assert that every Man is born free. No Man is or can be born a Slave. This Maxim is what every free Government in the World is founded upon. This Maxim is what the British Government is founded upon. This and This only can support the glorious Revolution. Edwards Jr. witnessed an increase in antislavery sentiment in the last decades of the 18th century. Connecticut, where he served as a minister until 1799, passed a gradual emancipation law in 1784, declaring that any child born to an enslaved woman after March 1st would be freed at the age of 25. Since 1777, five other northern states had passed similar laws. When he delivered his antislavery sermon in 1791, Edwards had reason to hope that “the light of truth” about slavery’s evils would eventually lead to its abolition throughout the entire country. Antislavery essay by Jonathan Edwards Jr., published October 22, 1773. In 1798, a Reverend Robert Wilson from South Carolina anxiously wrote Edwards Jr. for advice. Wilson feared being prosecuted for sedition if he preached openly against slavery, and asked whether he should leave the South or perhaps abandon his religious career entirely. Edwards’s answer was an unqualified no: “You are duty bound to remain in the ministry in your present situation.” And though he advised Wilson to avoid being jailed for sedition if possible, Edwards suggested that he could still oppose slavery by sharing his views privately and encouraging younger ministers and students. Edwards Jr.’s unwavering principles earned him a reputation for severity even among friends and relatives. But none could deny his sincere “sympathies for the afflicted and suffering.” An early biographer found numerous sermons marked “Preached to the negroes” among his papers. And one colleague recalled the moment he learned just how deep the antislavery minister’s compassion ran. It was a communion service in Schenectady. Edwards Jr. had recently arrived from New Haven, still finding his bearings in a state with tens of thousands more slaves than Connecticut. New York was a different world, and Schenectady had a larger enslaved population than anywhere Edwards had lived before. “In that city were many Africans, both slaves and freemen,” his colleague recalled, “a number of whom were professors of religion.” Several were in the church that day, but as the white congregants proceeded to receive communion, Edwards noticed that the Africans and African Americans attending the service held back. This was nothing new to his colleague, who knew that the black congregants “usually came to the Lord’s table after the other members.” But to Edwards Jr.—“one who had taken the stand that he had in favor of the colored race, and who felt much in their behalf”—the sight of prejudice treated as routine in God’s house was too disturbing to ignore. In the middle of the crowded church, his new colleague sitting astonished beside him, Jonathan Edwards Jr. began to cry. Edwards, Jonathan, Jr.; 1765; Undergraduate Alumni Records, 18th Century, Box 14; Princeton University Archives, Department of Rare Books and Special Collections, Princeton University Library. Timothy Mather Cooley in William Buell Sprague, Annals of the American Pulpit (New York: Robert Carter & Brothers, 1857), 659. Benjamin Rush to John Montgomery, letter dated 11 September 1785 in L. H. Butterfield, ed., Letters of Benjamin Rush (Philadelphia: American Philosophical Society, 1951). Calvin Chapin in Sprague, Annals of the American Pulpit, 657. Tryon Edwards, ed., The Works of Jonathan Edwards, D. D. Late President of Union College. With a Memoir of His Life and Character by Tryon Edwards, Vol. I (Andover, MA: Allen, Morrill & Wardwell, 1842), xxvi-xxvii. Timothy Mather Cooley in Sprague, Annals of the American Pulpit, 659. Calvin Chapin in ibid., 658. Timothy Mather Cooley in ibid., 659. Edwards, ed., The Works of Jonathan Edwards, xxv. Robert Smith, “The Perfect and Upright Man” in Edwards, ed., The Works of Jonathan Edwards, 512. Jonathan Edwards Jr., Observations on the Language of the Muhhekaneew Indians (Boston: Phelps and Farnham, 1823), 6. Sarah Rivett, Unscripted America: Indigenous Languages and the Origins of a Literary Nation (New York: Oxford University Press, 2017), 11, 172. Edwards Jr., Observations on the Language of the Muhhekaneew, 7. Robert L. Ferm, A Colonial Pastor: Jonathan Edwards the Younger: 1745-1801 (Grand Rapids, MI: Wm. B. Eerdmans Publishing Company, 1976), 15; Edwards Jr., Observations on the Language of the Muhhekaneew, 7; Sprague, Annals of the American Pulpit, 654. Ferm, A Colonial Pastor, 15. Sprague, Annals of the American Pulpit, 654. George Washington to Jonathan Edwards Jr., letter dated 28 August 1788, National Archives: Founders Online, accessed 2 October 2018, https://founders.archives.gov/documents/Washington/04-06-02-0431; Rivett, Unscripted America, 182. Kenneth P. Minkema, “Jonathan Edwards on Slavery and the Slave Trade,” The William and Mary Quarterly, Vol. 54, No. 4 (Oct. 1997), 829. “Some Observations upon the Slavery of Negroes,” “An Address to Americans, Upon Slave-Keeping,” and continuations, October and November 1773, The Connecticut Journal and New-Haven Post-Boy (New Haven, CT). Edwards Jr. used the alias “Antidoulios” in two untitled articles in his 1773 series: 29 October 1773, The Connecticut Journal and New-Haven Post-Boy (New Haven, CT), p. 1; 12 November 1773, The Connecticut Journal and New-Haven Post-Boy (New Haven, CT), p. 1, 4. “Some Observations upon the Slavery of Negroes,” The Connecticut Journal and New-Haven Post-Boy (New Haven, CT), p. 1. [Untitled], 12 November 1773, The Connecticut Journal and New-Haven Post-Boy (New Haven, CT), p. 1, 4. Jonathan Edwards Jr., The Injustice and Impolicy of the Slave Trade, and of the Slavery of the Africans (New Haven, CT: Thomas and Samuel Green, 1791), reprinted in James G. Basker, ed., Early American Abolitionists: A Collection of Anti-Slavery Writings, 1760-1820 (New York: Gilder Lehrman Institute of American History, 2005). Sarah Gamertsfelder, “The Injustice and Impolicy of the Slave Trade by Jonathan Edwards” in Basker, ed., Early American Abolitionists, 135-138. [Untitled], 8 October 1773, The Connecticut Journal and New-Haven Post-Boy (New Haven, CT), p. 1; “An Address to Americans, Upon Slave-Keeping,” 22 October 1773, The Connecticut Journal and New-Haven Post-Boy (New Haven, CT), p. 1-2. Edwards Jr., “The Injustice and Impolicy of the Slave Trade, and of the Slavery of the Africans” in Basker, ed., Early American Abolitionists, 144. Ferm, A Colonial Pastor, 93. Edwards Jr., “The Injustice and Impolicy of the Slave Trade, and of the Slavery of the Africans” in Basker, ed., Early American Abolitionists, 162. Gamertsfelder, “The Injustice and Impolicy of the Slave Trade by Jonathan Edwards” in Basker, ed., Early American Abolitionists, 138. Jonathan Edwards Jr. to Rev. Robert Wilson, transcription of letter dated 16 November 1798 in Edwards, Jonathan, Jr.; 1765; Undergraduate Alumni Records, 18th Century, Box 14; Princeton University Archives, Department of Rare Books and Special Collections, Princeton University Library. Edwards, ed., The Works of Jonathan Edwards, xxvii. “Second Census of the United States, 1800,” National Archives, accessed 3 October 2018, www.archives.gov/research/census/microfilm-catalog/1790-1890/part-02#1800. In 1800, 951 enslaved people lived in the state of Connecticut, with 236 in the New Haven area in 75 in the city proper. That same year, more than 20,600 enslaved people lived in the state of New York, with 1,808 in Albany County (where Schenectady was located). Edwards, ed., The Works of Jonathan Edwards, xxvii-xxviii.